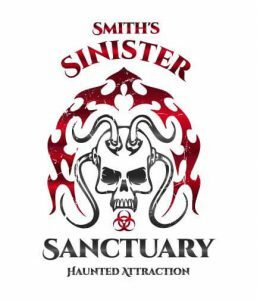 Smiths Sinister Sanctuary is a Haunted Attraction located in Lake Park, GA.
Smith’s Sinister Sanctuary is a non-profit Haunted House. Organized and built by volunteers. Proceeds benefit Don’t Be A Monster and The Haven. All customers must sign a waiver to enter the haunt. If you are looking for a haunt that will keep you scared and on your toes the whole way through, …show more this is your place! It is an incredible experience. It’s interactive and the actors are phenomenal. Every room is decorated perfectly. I have never been to a haunt similar to this one! 10/10!! Great haunt, very much worth the short drive & short wait!